Teeth naturally wear down as people age. Aged teeth are more likely to have chips, cracks or a generally uneven appearance. . Such wear and discoloration may be natural or the result of a genetic predisposition; however, it is often increased as a result of your habits (soft drink, tea, or coffee consumption, smoking, medication use, etc.). Your teeth may become discolored either because of root canal treatment; excessive fluoride; or the presence of large resin fillings. Certain people may be born with abnormal spacing between the teeth that grows wider as they age. 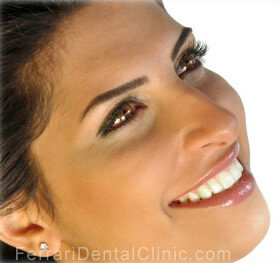 Regardless of what causes unattractive teeth, dental veneers may solve most of your cosmetic dental issues. 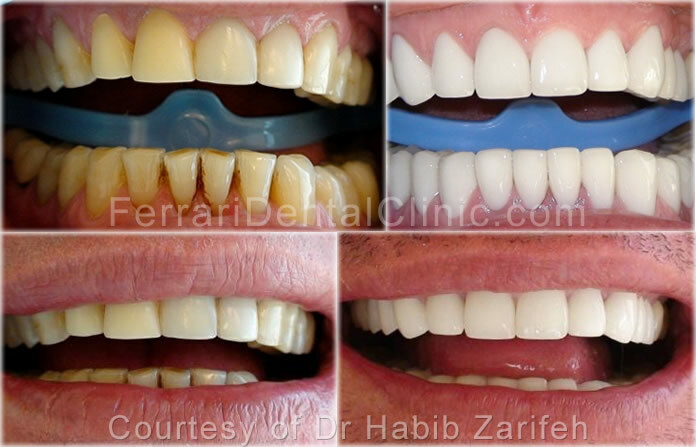 At Ferrari Dental Clinic Lebanon, the team of dentists offers cosmetic procedures with dedication and excellence. Visit Us at our veneers website specially published to explain to our patients the One Session veneers Lebanon Beirut by Dr.Habib Zarifeh the Cerec Dentist. In dentistry, a veneer is a thin custom-made shell crafted of tooth-colored materials designed to cover the front side of teeth, either to improve the aesthetics of a tooth, or to protect a damaged tooth surface. They are "cemented" to the front surface of teeth to improve their cosmetic appearance. Getting a dental veneer usually requires three trips to the dentist – one for a consultation and two to make and apply the veneers. A composite veneer may be directly placed (built-up in the mouth), or indirectly fabricated by a dental technician in a dental laboratory, and later bonded to the tooth, typically using resin cement. Dental porcelain veneers fall into the category of cosmetic dentistry because they create a bright, white smile with beautifully aligned, shapely teeth. Even better, the translucent ceramic quality of today's veneers provides a more natural look than what's been available in the past. In contrast to composite veneers, a porcelain veneer may only be indirectly fabricated. Porcelain veneers will typically last between five and ten years. The bottom line is that your veneers will eventually need to be replaced. To make your veneers last longer, follow a good oral hygiene program and visit your dentist for check-ups on a regular basis. Veneers offer a conservative approach to changing a tooth's color and shape -- veneers generally don't require the extensive shaping prior to the procedure that crowns do, yet offer a stronger, more aesthetic alternative. This 40 year old patient wanted to make changes to her smile. Her lateral incisors were missing and she had an old ceramo- metallic anterior bridge to replace them also, the biting edges of her misaligned lower teeth showed evidence of extensive wear. Porcelain veneers were placed in order to resolve her dental problems and restore the shape and color of her front teeth. The veneer's color cannot be altered once in place. If you plan on whitening your teeth, you need to do so before getting veneers. Individuals who clench and grind their teeth are poor candidates for porcelain veneers, as these activities can cause the veneers to crack or chip. Once veneers are bonded into place, they are relatively strong and durable; however, your dentist may recommend you wear a protective appliance while your sleep, especially if you are a bruxer . You may also need to avoid some foods and beverages that may stain or discolor your veneers such as coffee, tea or red wine.